During a long, rambling press conference, President Trump’s abrupt, heated exchange with reporter April Ryan became a flashpoint of anger, mockery, and backlash among viewers on Twitter. “Disgusting,” is how activist Shaun King categorized the exchange. “This just can’t be real life,” said Deraey McKesson. 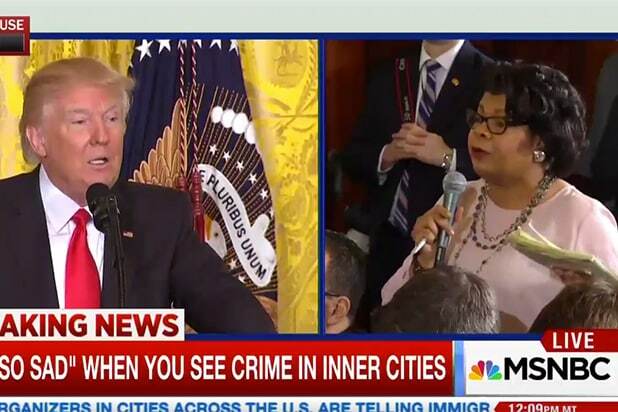 Veteran Black reporter asks Trump if he'll meet with the Congressional Black Caucus. Reporter: Are you going to meet with the CBC? Reporter: The Congressional Black Caucus. I'm excited for the all black people meeting w/ the Congressional Black Caucus at Frederick Douglas' house in the inner city; finna be lit!! Guess all us Black folks must roll with the Congressional Black Caucus when we aren't all dodging bullets in the inner city. Trump tells black reporter to set up a meeting for him with Congressional Black Caucus. You know not all black folks know each other right? @CNN He's got a staff. The GOP controls Congress. But he asks the black reporter to set up a meeting with the Black Caucus?